Unsure of how to get started taking online surveys? Here’s a detailed explanation. 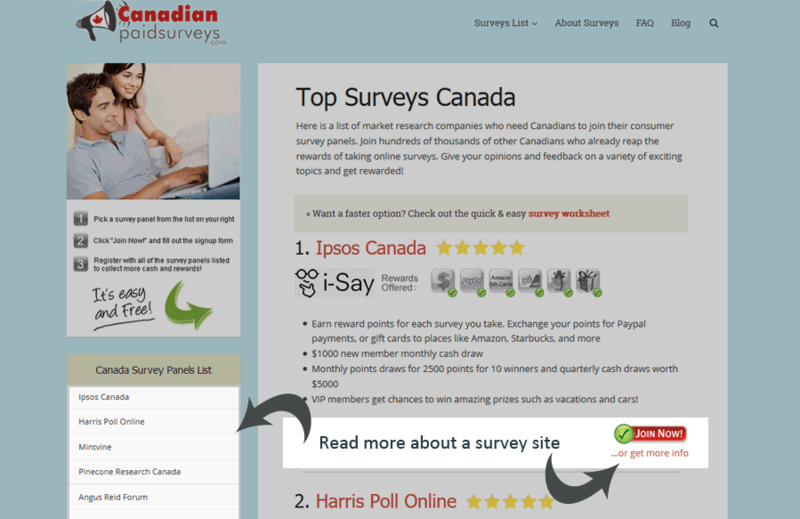 First, CanadianPaidSurveys is an online survey company DIRECTORY. What this means is that we partner with market research companies who need people who join their panel. They ask us to recruit people to join their panel so they can build up a database of people available to take surveys. When you visit our website, you are presented with a list of online survey companies who need Canadians to become members of their panels. You can read about each one on our website and decide for yourself whether or not you wish to join that particular panel. You can become a member of as many or as few survey panels as you want – it’s completely up to you. Just remember that the more panels you join, the better your chances of being contacted to take surveys. No. Neither will our website, CanadianPaidSurveys, or the survey companies we have listed here will ever charge you anything to join. The survey companies want to reward you for your opinions, not charge you for a membership! So, when you’re done registering to become a member of the survey panels, you should then start checking your e-mail daily to see if you’ve been sent any invitations to complete surveys. The invitation to complete a survey will come directly from the survey company you registered with and will contain: the topic of the survey, the approximate length of time it will take you to complete it, and the incentive you will receive for taking the survey (cash, points, a product, etc.). Again, it’s up to you if you want to complete the survey or not. I still don’t get this – now what? If you’re still unclear on a few things, feel free to contact us, and we’ll be happy to answer any questions you may have.